Composite photograph of McLellan employees. Pictured are: Lois Carter, Thelma Stewart, Dorothy Dillon, Blanche Webb, Hazel Trew, Helen Whitesell, Hazel Bryant, Gladys Pollard, Sallie Hunt, Elsie Higgins, Helen Harris, Vera Hamilton, W.J. Edwards, T.E. Summers, Barbara Eanes, Marguerite Bradley, Estelle Bishop, Elsie White, Thelma Hamblin, Madeline Mitchell, M.L. Mason, B.A. Plewes, Arline Smith, Helen Grubb, Minnie Wade, Gladys Gibbs, Mary Sue Wolfe, Eloise Smith, Esterleen Nash, Elizabeth Riggins, Christine Mercer, Dorothy Forbes, Virginia McBride, Jessie Stultz, Bessie Trainor, Francis Fox, Hazel Lovelace, Margaret Obenchain, Audrey Wade, Nolia Hodges, Thelma Robinson, and Louise Workman. 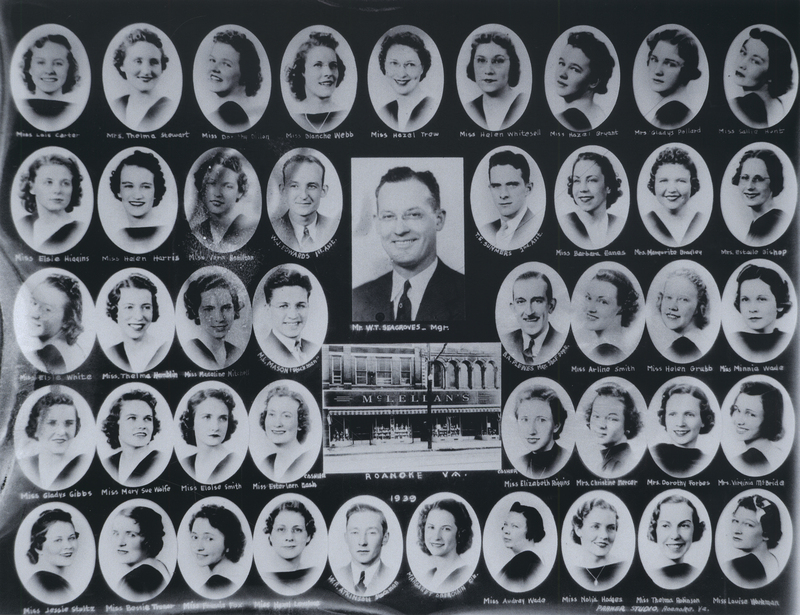 Parker Studio, “PS 278 McLellan Employees,” Virginia Room Digital Collection, accessed April 19, 2019, http://www.virginiaroom.org/digital/document/PS278.